This review is long overdue. 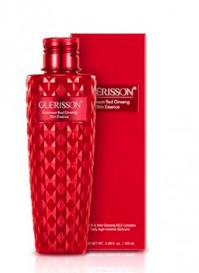 Guerisson is one of my favourite Asian/Korean skin care brands. The products aren't overly fussy or difficult to use, their simple and effective. The only thing that probably turns people away is the use of horse oil. I can't tell you with any authority whether or not the oil used is obtained ethically or through sustainable means. I have read though that in Japan horses are farmed and raised for their meat, so the oil is a by product of this process. I currently own 4 products from the brand, their product range isn't broad ( I stand corrected, after visiting their website, I found that they've expanded the line adding quite a few products) so I'm only missing an item or 2. I'll review the products in the order that I would use them. I think you'll hear this a bit, but I love this toner. It's clear and looks like water both in the bottle and in my palm. It does have a slight scent to it but nothing too overwhelming. Texture wise the consistency of this product is again similar to water, it's thin and light weight. I like to place a small amount into the middle of palm and then pat it gently into my skin. Because this toner is so light weight yet moisturizing I like to pat it in several layers. When applied my skin doesn't feel heavy or weighed down, although it does noticeably feel softer to me and just a little plumper. This product is slightly thicker than the toner and is cloudy in appearance Like the toner it has a slight scent to it, I'm reminded of oranges or citrus when I smell it. When applying I place a small amount of toner into my hand, the bottle has a small opening in the top that allows you to dump it out. Because it's a bit more viscous, not as much product comes out. I gently pat the essence into my skin, it absorbs fairly quickly and does leave my skin slightly tacky for a bit until everything sinks in. I typically just apply one layer unless my skin has been super dehydrated. This cream comes in a tall bottle similar to the toner and essence but it has a pumo dispenser so it's easier to control the amount of product that I use. The cream is white in colour and has the same citrus scent has the rest of the line. The cream is light weight and sinks into my skin quickly, though it does tend to leave me looking quite shiny. My face doesn't feel greasy or weighed down when the cream is applied. This is the last step, it's also the first product that I tried from the brand.This cream comes in a jar and has a slight yellow tint to it, the scent is that same faint citrus, which i find pleasant. I think of this product as a sealant. It's what I apply to lock all the moisture layers in. It looks like it's a heavy cream but it's not. You only need to use a small amount, as it spreads easily on the skin. This also leaves my skin looking shiny, however my skin is not tacky. I assume that this product has a higher concentration of the horse oil, so I would keep it away from your eyes has it may irritate them, as oils tend to. I've discovered that the Guerisson line has expanded and I'm so excited about it. I don't think I'll be grabbing the shampoo, though now that I think about it, the shampoo and conditioner might actually be a good addition to my hair care routine. Horse oil has ceramides and ceramides are good for you hair. Okay I just need to see a good sale from this brand and I'll pick up everything. I've had my eye on this cream for what feels like forever. It looks like a mix between the moisturizer and cream, the perfect blend. I imagine that it's got a cloud like texture and just melts into my skin. it'll have the same citrus scent and will probably leave my skin looking dewy and soft. This cream will one day be mine. Ohh, ohhh. This cream looks like it will be so nice. The ginseng sounds intriguing.It's advertised as having anti-aging properties, not that I need that right now, but ginseng is known for being good for you skin, it's said to boost collagen production- which helps make your skin look plump and nice, it also encourages skin regeneration which means your skin looks smoother, softer and healthier. Like the cream above, all the goodness of horse oil and ginseng combine in this essence. I think it would be lovely to use. I already like the regular essence so I know for sure, that this essence will be moisturizing and soften and plump my skin. I think it would be perfect to use in conjunction with a chemical exfoliation routine. I will admit, that the packaging of this line is lovely . So initially when I saw this I was like nope, don't need it but the more I thought of it the more I realized that it in fact be a good addition to my routine. I like how moisturizing the skin care products are, and I'm sure that some of those same components have been added to the hair care line up. 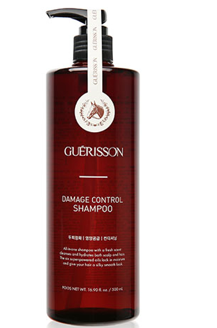 Have you tried any of the Guerisson 9 Complex products? What did you think? If you haven't tried any, do you want to or does the horse oil put you off?